King, a wire fox terrier, poses for photographs after winning Best in Show at the 143rd Westminster Kennel Club Dog Show Tuesday. It’s the 15th time a wire fox terrier has taken the top spot. 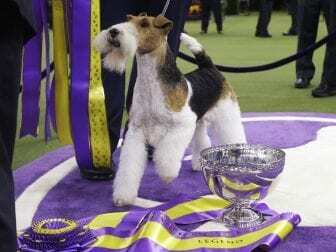 A wire fox terrier, originally bred to help hunt foxes, should be “alert, quick of movement, keen of expression, on the tip-toe of expectation at the slightest provocation,” reads the American Kennel Club’s official standard. The standard goes on to describe, in detail, what the dog’s body should look like and how stiff the coat should be. Bono the Havanese won second place. Also in the finals was Burns the longhaired dachshund, a fan favorite. Burns has won 26 best in show titles at various dog shows, but never at Westminster, the New York Times reported. ” I think one of the reasons some breeds don’t make it to the end is that they just aren’t the glamour breeds who are so flashy in the group,” Walter Jones, a vice president of the Dachsund Club of America, told the Times.